Aging and sun damage cause your skin to look old. Other issues such as wrinkling around your eyes and mouth, discoloration of the skin, and scarring due to superficial acne don’t make a pretty picture. To rejuvenate that skin and regain a more youthful look, Dr. Kearney recommends the Croton Oil peel. A Croton Oil peel, also known as Hetter peel or modified phenol peel, penetrates into the deeper layers of the skin, addressing textural changes in the skin. By improving the skin’s deep structures, sun-damaged and wrinkled skin is dramatically improved. The patient gets radiant, smoother, and healthier-looking skin after a Croton Oil peel. What are the benefits of a Croton Oil peel? A Croton Oil peel tightens the skin, and improves the appearance of age spots and pigmentation problems. It also treats wrinkles around the mouth, forehead furrows, and crow’s feet. What can I expect during a Croton Oil peel? 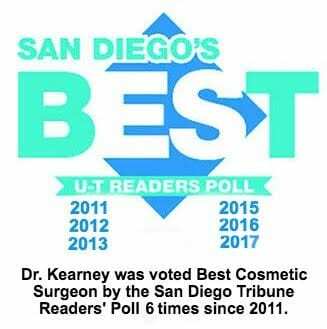 Dr. Kearney usually does Croton Oil peels together with other cosmetic procedures under general anesthesia. In some cases, the procedure may be done while the patient is under lighter sedation. The procedure usually takes an hour to complete. What can I expect for recovery from a Croton Oil peel? Patients usually return to work seven to 10 days after treatment. Any red or pink areas on the face may be concealed with makeup. Expect facial skin to be red or pink for a couple of months after the procedure but this can be easily covered with makeup. What does a Croton Oil peel cost? You can turn back the clock and have smoother, tighter skin with a Croton Oil peel for only $5,550. With CareCredit, you may also finance the cosmetic treatment you have always wanted. CareCredit has plans for everyone. You can choose from a 6, 12 or 18 month interest-free plan or a plan with terms of up to 60 months at 14.9%. CareCredit will grant you a “credit card” which you can use at our office. For more details or to apply, please call 1-800-365-8295 or visit www.carecredit.com. If you want to learn more about the Croton Oil peel in La Jolla, contact our office today.